Teddy Purcell's two goals came within 1:05 of each other and started the comeback. That was frustrating, huh? The Bruins played about as good a first period as you could have hoped for and a putrid final 40 minutes. Blowing a 3-0 lead is becoming a way too common theme for this group of Bruins and it’s disgusting. The Bruins had a tremendous opportunity to put themselves on the brink of their first SCF in 21 years and they pissed it away. It was almost like watching the Patriots wasting a 17 point lead against the Colts. You could see it coming but couldn’t do anything about it. Claude Julien should have called a timeout during the four minutes where the Bolts took the game over. After it’s 3-2 in about a minute’s time you need to call it. This team lacks a killer instinct that is very scary to me. Teams like Detroit would have thumped away to a 6-0 win and won the series in 5. The Bruins sleepwalk into a tie game then can’t respond in the third. Faceoffs were terrible tonight, almost all around. 39-26 and it was a huge factor. Claude had Tyler Seguin taking faceoffs tonight. You cannot have that. 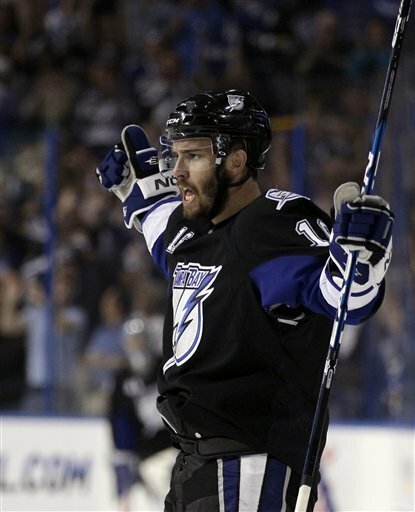 The Lightning have won their two games on roughly six minutes of great hockey. Kind of mind boggling. That’s okay if that isn’t the story of the series but right now it is. Bruins can’t take any shifts off against this team or have any mental breakdowns, they’re too talented. Someone needs to buy a leash and chain Tim Thomas to his net. Any time he handles the puck I cringe and his turnover today started the comeback. Who does Guy go with in Game 5? Smith hasn’t let in a goal in this series and Rolo’s been pulled twice. It’s interesting to see what he’ll do. Plus, the Lightning have a lot of momentum now for Game 5.